Stereotypical boy bands all have the same formula. The wardrobe is similar, the dance moves are choreographed and each member has their quirk – the funny one, the cute one, the bad boy, etc. 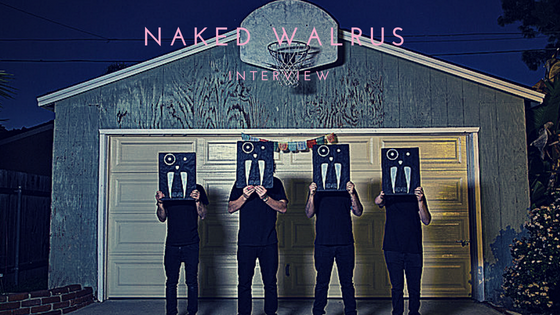 You may hear the name Naked Walrus and want to create a picture of a carefree, simple-lyric alt-rock band. You become genuinely surprised when you hear a wider range of instrumentals and positive songwriting. The EP itself has ‘hard-work’ written all over it. Despite the record’s title, the creative process of making it was quite the opposite. This was really the band’s first time for a lot of aspects – from recording at producer Curtis Douglas’ studio in Arizona to challenging themselves until they were collectively proud of their work. The guys are at the point in their lives where they’ve hit the 25 mark and wanted to discuss that ‘adult’ concept in their music. Ideas related to that concept were discussed as far as album titles – “Quarter Century” or “25” – but they much preferred the concept of the complex content they were creating. “‘All things that are simple can be complex on the inside’, so that’s what the whole mentality of this release is. It’s us trying to get people to scratch away the surface and think a little bit deeper than just what we look like – we call it anti-boy band marketing. With that, not only have we been doing things like naming it Simple when it’s complex but we’re doing these photo series where we don’t show our faces… we just want people to really be listening and watching the things that we’re creating,” Gartner said. This record represents a transition for the band; however, their positive lyrics have always been part of their strategy. From their single, “Minus”, to opening tracking “Now”, each song on Simple represents not only their transitions but any type of transition that their audience is going through. This record is meant to be shared with others and create inspiration for anyone that listens. So what does inspiration mean to Naked Walrus?